And the U.S. government would still be massively in debt. So why doesn’t the U.S. government just fire up the printing presses and print a bunch of money to pay off the debt? Well, for one very simple reason. That is not the way our system works. As you read this, the U.S. national debt is approximately 12 trillion dollars, although it is going up so rapidly that it is really hard to pin down an exact figure. So how much money actually exists in the United States today? Well, there are several ways to measure this. The “M3” money supply includes everything in the “M2” money supply plus all other CDs (large time deposits and institutional money market mutual fund balances), deposits of eurodollars and repurchase agreements. The Federal Reserve does not keep track of M3 anymore, but according toShadowStats.com it is currently somewhere in the neighborhood of 14 trillion dollars. But again, not all of this “money” actually “exists” either. When you go over to your local bank and deposit $100, they do not keep your $100 in the bank. Instead, they keep only a small fraction of your money there at the bank and they lend out the rest to someone else. Then, if that person deposits the money that was just borrowed at the same bank, that bank can loan out most of that money once again. In this way, the amount of “money” quickly gets multiplied. But in reality, only $100 actually exists. The system works because we do not all run down to the bank and demand all of our money at the same time. In fact, most banks have no reserve requirements at all on savings deposits, CDs and certain kinds of money market accounts. Primarily, reserve requirements apply only to “transactions deposits” – essentially checking accounts. #1) If all money owned by all American banks, businesses and individuals was gathered up today and sent to the U.S. government, there would not be enough to pay off the U.S. national debt. 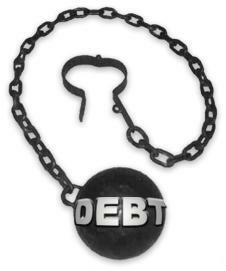 #2) The only way to create more money is to go into even more debt which makes the problem even worse. If you owe more money than ever was created you can never pay it back. That means perpetual debt for as long as the system exists. Of course if we had listened to our very wise founding father Thomas Jefferson, we could have avoided this colossal mess in the first place…. But we didn’t listen, did we? So unless you are willing to fundamentally change the current system, you might as well quit complaining about the U.S. national debt because it is now mathematically impossible to pay it off.